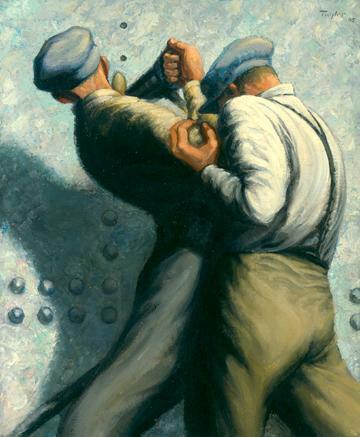 This is the second version of the subject and is based on sketches completed in 1943 at the United Shipyard in Montreal. A rivet gang works on the hull of a 10,000-ton cargo ship. A 1945 article explains Taylor's motivations: "He wishes, by expressing pictorially his admiration and respect for Canadian industry and industrial workers, to accomplish two things; first, to heighten the public's appreciation and respect for the contribution industry has made; and secondly, to strengthen the workers' self respect and pride by seeing their work as others see it."